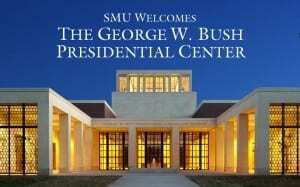 SMU is preparing to celebrate the opening of the George W. Bush Presidential Center and welcome the worldwide visitors who will attend dedication events on campus April 24-26, 2013. The Bush Center, located on a 23-acre site on the east side of campus, houses the Presidential Library and Museum and the George W. Bush Institute. The Library and Museum will open to the public Wednesday, May 1. Information about parking, road closures and campus events April 24-26 is available at smu.edu/bushcenter. Answers to frequently asked questions about the Bush Center dedication and opening. Due to space limitations, attendance at the dedication ceremony planned by the Bush Center Thursday, April 25 is by invitation only. The invited guests expected to attend include President Barack Obama and former presidents George H.W. Bush, Jimmy Carter and Bill Clinton, along with other government officials from the administration of George W. Bush. The ceremony will be streamed at BushCenter.org. Residents of University Park and Highland Park also can view the ceremonies on SMU-TV, Channel 19. Although dedication events will bring a large number of special visitors to campus, SMU will remain open so that teaching will continue uninterrupted. To accommodate class attendance, alternative transportation and parking plans are available at smu.edu/wheretopark. Faculty, staff and students with parking questions may e-mail parking@smu.edu or call 214-768-7275. The SMU community will have the opportunity to watch a simulcast of the formal dedication ceremony at McFarlin Auditorium (SMU ID required). Doors open at 9 a.m. Faculty, staff and students should register here. An outdoor Jumbotron north of University Boulevard, near the Dedman Life Sciences Building and the Late Fountain, also will show the proceedings. Faculty, staff and students also may watch the dedication at 9 a.m. CDT online at bushcenter.org or on Park Cities Cable Channel 19. During the evening of April 25, students, faculty and staff have been invited to attend the SMU Boulevard Block Party and Lighting of Freedom Hall. If you registered for the block party, you must pick up your tickets in advance at the Hughes-Trigg Mane Desk at any of the times noted below. The first 500 students to pick up their tickets will receive commemorative Croakies; the first 1,000 people to pick up their tickets will receive a commemorative T-shirt. Monday, April 22: 11 a.m. – 1 p.m. and 4 p.m. – 7 p.m.
Tuesday, April 23: 11 a.m. – 1 p.m. and 4 p.m. – 7 p.m.
Wednesday, April 24: 11 a.m. – 1 p.m. and 4 p.m. – 7 p.m.
Thursday, April 25: 11 a.m. – 1 p.m.
April 29 is a special preview day at the Bush Presidential Library and Museum for SMU faculty, staff and students. All available spaces have been taken. Visit smu.edu/smuday for more information. Please note that SMU IDs are needed for SMU students, faculty and staff to enter events during the week of the Bush Center dedication. Please send parking questions to parking@smu.edu and other questions to bushdedication@smu.edu. The 43rd president of the United States was the unadvertised guest of honor Friday, April 19, 2013 at an outdoor ceremony welcoming the George W. Bush Presidential Center to campus. More than 3,000 SMU alumni, students, faculty and staff cheered and waved as Bush strode to the speaker’s platform and later expressed his thanks to the University. 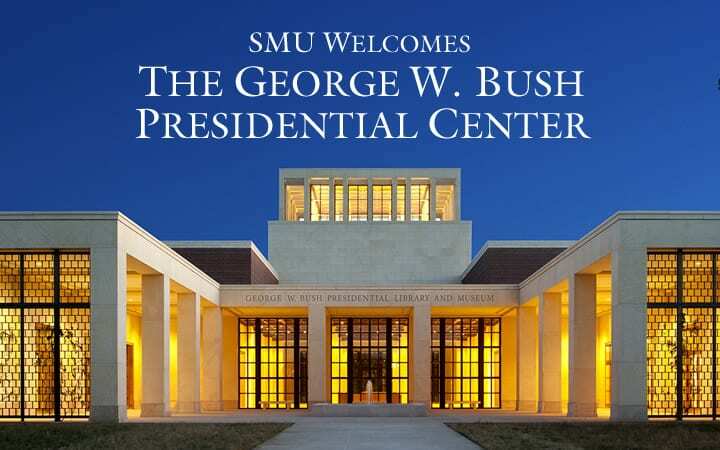 SMU is preparing to welcome the worldwide visitors who will attend dedication of the George W. Bush Presidential Center events on campus April 24-26. Click the YouTube screen to watch the welcome event video, or visit this link to open video of SMU’s welcome ceremony for the Bush Presidential Center in a new window. The George W. Bush Foundation has announced that Ambassador James K. Glassman – a public policy scholar, diplomat and journalist – will be the founding executive director of the George W. Bush Institute. The Institute will be part of the George W. Bush Presidential Center. Former President George W. Bush had lunch with President’s and Hunt Scholars and addressed a class of journalism students during an April 29 visit to the SMU campus. “I was trying to impart some knowledge,” Bush told SMU Daily Mustang reporter and student Shelly Smith as he came out of Journalism Lecturer Carolyn Barta‘s class, where he had spent more than an hour. Bush and Barta first met during his 1978 run for Congress, when she was a newspaper reporter. She invited him to talk to her class.